There’s a lot to love about eBooks – they’re portable, can be accessed over the Internet, and they can be shared quickly and conveniently. 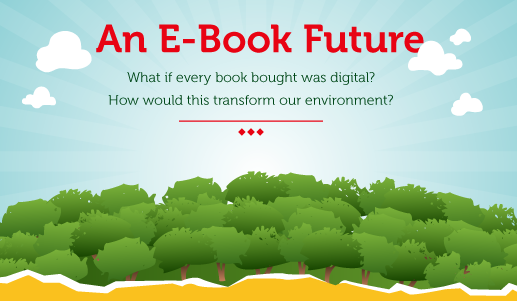 Something most people don’t take into consideration when they say they love them, though, is that eBooks can be a greener choice than today’s physical books end up being. With more resources at low enough levels to impact environmental stability and more habitats being destroyed by deforestation and the search for fossil fuels, making even a small choice for a greener life can be important. So when you’re looking for that next little change that can help you have a bigger impact and thinking about switching to eBooks, here’s the rundown of how they help (and maybe even hinder) efforts towards green living. The printing press came into use in the mid-15th century and has not gone out of style even today. Mass printing can be done on huge scales now and book publishers routinely release millions of copies of new titles at a time to satisfy market demand. The problem with this method of delivery is the carbon footprint that printing is responsible for. A carbon footprint is generally defined as the total amount of greenhouse gasses an individual or group is responsible for. Every person on earth has some level of footprint on the carbon register due to carbon dioxide, but beyond that, the impact of carbon emissions from cars, factories, large building construction and other industries is a concern, as it is affecting the quality of air and atmosphere we depend on for existence. The printing industry has historically had a very high carbon footprint. The harvesting of enough timber to turn into paper alone has a high emission of greenhouse gasses and then considering that this harvesting removes trees that release oxygen that helps balance our own intrinsic carbon footprints, the impact on the environment can be astronomical. Thankfully, eBooks don’t require trees to be produced or even read. They’re not all green energy, due to the minerals that go into the electronics that most people prefer to read their eBooks on, but because they are meant to be used many times over, their impact is drastically less than that of print books. One eReader can be used to read literally thousands of books and as most of them require a charge once a week or even less, depending on how voracious a reader’s appetite is, eReaders begin to look like the more green approach to reading. It’s not a surprise that readers have taken such a shine to eBooks, given their ultimate portability over paper copies, but the real convenience of an ebook is their availability to almost anyone thanks to the Internet. There are hundreds of stores available with just a few button clicks and they offer hundreds of thousands of titles to meet any interest or need. Online eBooks have helped the popularity of websites like Barnesandnoble.com because they offer a selection of titles for instant access. There’s no need to travel to the store to pick up a copy of the book you’re looking for when you can get it via electronic delivery in just a few seconds. The NOOK online eBooks takes delivery of popular classics and the most anticipated new titles quick and convenient. And many eBooks offer wireless or 3G cellular access to their respective stores so you can shop on the go from anywhere you have a signal. When you’re looking to reduce your carbon footprint and you’re a bookworm, an eReader may be the best way to go for all your reading needs; they offer the classics (many of which are available free) and new material, but there are also other ways you can reduce your impact on the environment and still enjoy a good book. Many publishing companies today have made commitments to greener practices in all areas of their business and recycled materials are now being used more than ever to print physical books but there’s another way to commit to being green and still read a good book. If the book was published 20 or more years ago and is still around, it’s going to have the lowest carbon footprint of all. That’s the beauty of a good book well cared for and the green movement as a whole. When you seek to reduce your impact on the environment, you normally look to reuse as much as possible. Books make it easy to find something truly special, even if the cover is a bit worn or faded. If you’re looking for a way to lower your impact on the environment, an old book is a good place to start. They’re readily available everywhere from thrift stores to second hand bookshops and have a very low carbon footprint, but if you’re a truly voracious reader and want to keep up on all the current titles coming to the market, an eReader allows you to tote around hundreds of good books in a tiny package and because it’s meant to be reused over and over again, it offers a modern take on a problem that’s already been around for some time. Invest in an eReader and get good books online, anytime, anywhere. Not just breathing is leaving carbon footprints, even the usefulness of the meanings of data on the display have got the impact against the floor of the greenhouse. and at a place to satisfy avidity for new interconnection formations in the marketplace of greenhouse. So the net of interconnections is leaving carbon footprints as well as the part of formations in the marketplace of energy exchange, and this environment of balances of our own readings can be astronomical, and this astronomical breathing is spreading the universe of flows and balances. to dance or not to dance, to leave footprints or not to leave footprints. Saying ebooks have a lower carbon footprint without providing any data to back that up is as a trustworthy statement as its very opposite. For a honest consideration of what their carbon footprint is one has to consider the full cycle: not just the materials (and what’s required to obtain them), the generated byproducts and required energy that goes into manufacturing them, but also in using those devices (they don’t run on air) and ultimately disposing them in a world where the usage lifespan we give to gadgets is progressively shorter, as we substitute them earlier for their fancier newer generations. And just as well, we have to add the carbon footprint of the infrastructure needed to actually be able to purchase and have them delivered to us (behemoths as Amazon are hardly irrelevant for the environment). The conclusion might end up being that it is almost impossible to determine and therefore compare the carbon footprint of the printed vs digital publishing industries, but that is at least being more rigorous than throwing assumptions as unreferenced facts as a justification for keeping consuming what we decide to consume because we like how convenient they are usually irrespective of their actual environmental cost.